The Dynaso Balance Board Package system (also refered to as a "bosu") is a multi function, core training platform, specially designed to be integrated into cardio fitness, sport performance and rehabilitation all in the one product. Ideal for personal trainers, this system can be used to increase abdominal muscle recruitment, balance and core strength and similarly for physiotherapists and core conditioning. By utilising the resistance bands during core body training, contractions can be stabilised to keep alignment in place, furthering your workout. The resistance bands easily buckle to the two ringlets on the side of the base of the dome. The base is completely stable with padded dots to avoid slipping. The rubber construction across all elements is thick, durable and not easily worn out. By adjusting the pressure within the dome, you can adjust the difficulty of your exercises. 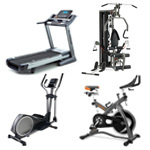 Buy Dynaso Balance Board Package from Fitness Market and save! With our efficient dispatching and quick delivery throughout Australia, Dynaso Balance Board Package can be yours sooner. Below you can rate and add reviews for Dynaso Balance Board Package.